Madison sells the most wonderfull medieval gowns. I found two free ones in her store. Great for RP. First there's Ulla. 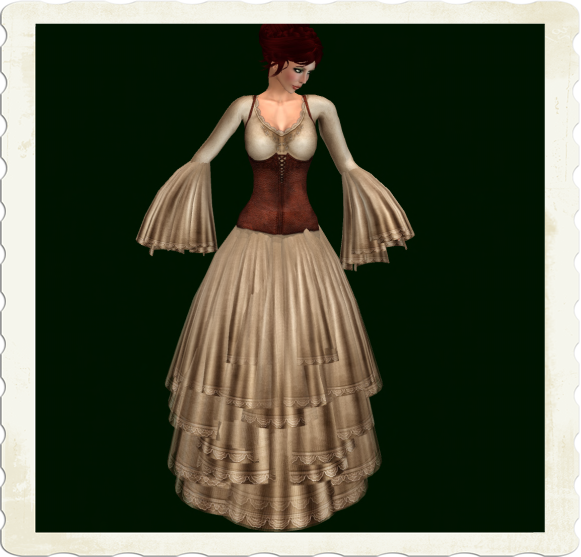 Detalied and laced, a corset that makes a very thin waist. Also flat shoes come with this every day dress. Caren McCaw's CMC is a large sophisticated shop with the most wonderfull skins. This megan skin is hidden in a large free surprisebox for new residents, full of skins and eyes and also this lovely modifiable shape. The hair Ophelia is to be found on the freebie/ discount wall at Evie's closet. Evie marked most of her outfits down to 50 % of the original price. And that's a bargain for what (mostly fantasy themed outfits) she has in her store. Eyes are from my free package described in an earlier post. These are the dark hazel ones.